I’m dreaming of cool drinks, drier air, mountains and tons of great food. All of those things I’m dreaming of will become reality once I start vacation next week. Great food and cool drinks happen often in Florida. But dry air is a treat whenever it decides to grace us with its presence. The only mountains you’ll find in Florida are the grand landfill mountains. If you’ve ever driven on I-95 or the Florida Turnpike in south Florida, you know exactly which mountains I speak of. Speaking of mountains, it’s been 12 years since I last saw real mountains. The last mountains I saw were the same mountains I will see again next week. Las Vegas mountains, here I come. I won’t actually be going to the mountains. But I will be able to see them. If you’ve never been to Vegas before, I’ll let you in on a little secret: the city is surrounded by mountains. Even though the mountains are off in the distance, they can be seen from just about any high floor hotel, if not all of them. First mission of the trip: requesting a mountain view room once we check into the hotel. All of this talk of the land of heat and dry air has me craving an ice cold, fruity drink. 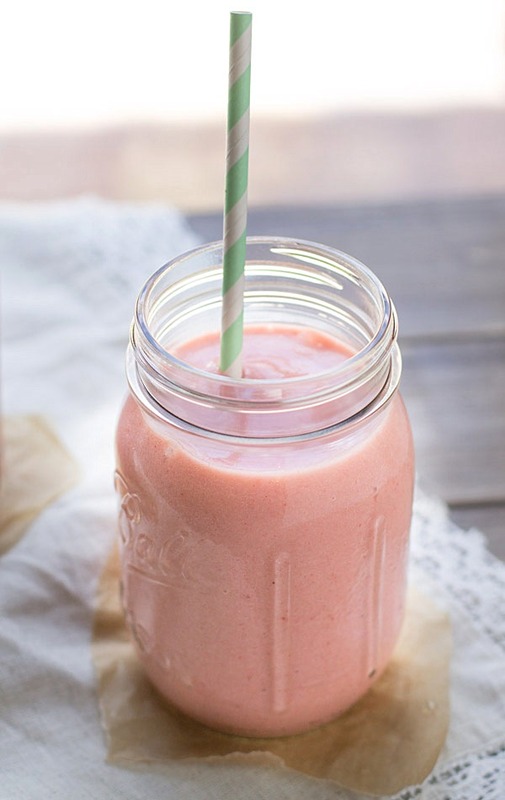 This Strawberry Peach Smoothie would hit the spot. If I wanted to be a little daring, I could even add a splash of rum or vodka to the mix. Coconut milk makes this smoothie dairy free but if you love the almonds, or don’t have the coconut milk, you can still achieve the level of dairy free smoothie master by using almond milk. If you’re a dairy milkaholoic, go ahead, use up that dairy milk that’s sitting on the top shelf of your fridge. 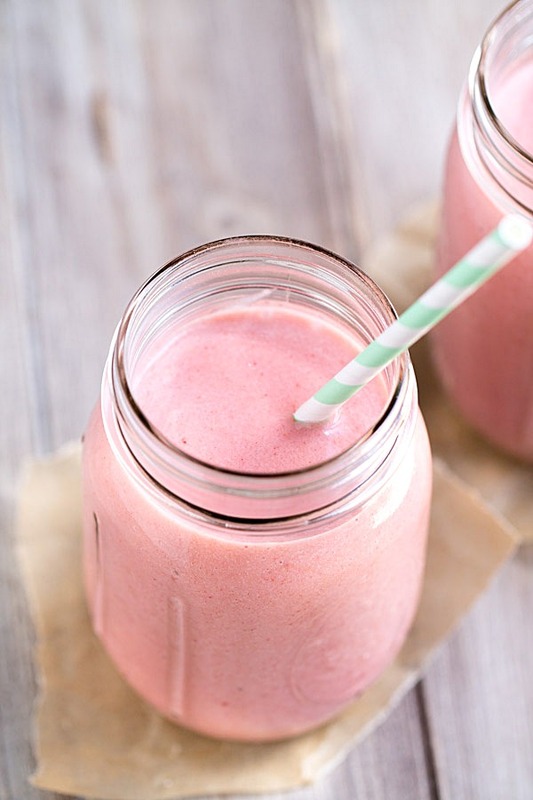 Frozen fruits work best in this smoothie. They’ll keep your smoothie cold without having to add ice. I added a frozen banana into the mix to kick up the creamy-ness factor. Cause who doesn’t love a creamy smoothie? Adjust the liquids to alter the smoothie thickness to suit your preference. For a thinner smoothie, you can increase either the water or the coconut milk. Give it a splash of extra coconut milk if you want to boost the coconut flavor. If you’re more of the mellow type and don’t want your smoothie bursting with coconut flavor, just add more water. Whatever you choose to do, I hope you enjoy the recipe. Place all ingredients into a blender. Pulse a few times and then blend on medium speed until smooth, about 1 minute. subbing the coconut milk with another type of milk will alter the nutrition content. Oh how fun! I love visiting the mountains. The view is so pretty! Ok, I also really enjoy the lack of humidity ;) This smoothie is gorgeous, you achieved the prettiest color! Pinning! The past could weeks here in South Florida have been AWFUL when it comes to humidity! If it wasn’t so humid, it would actually feel nice out in the mornings and evenings because the air temp is actually pretty nice. But darn you, humidity! Glad you enjoyed this recipe, Mary Frances. And thanks for the pin! hahha you are going to have a great vacation in Las Vegas!! Can’t wait to see some pictures! This smoothie looks so refreshing. Yeahhh!!! Can’t wait. I’ll be Instagrammin while I’m there and taking some good shots with the DSLR. :) Thanks for stopping by, Zainab! Hope you have a great weekend! Have a great time on vacation! 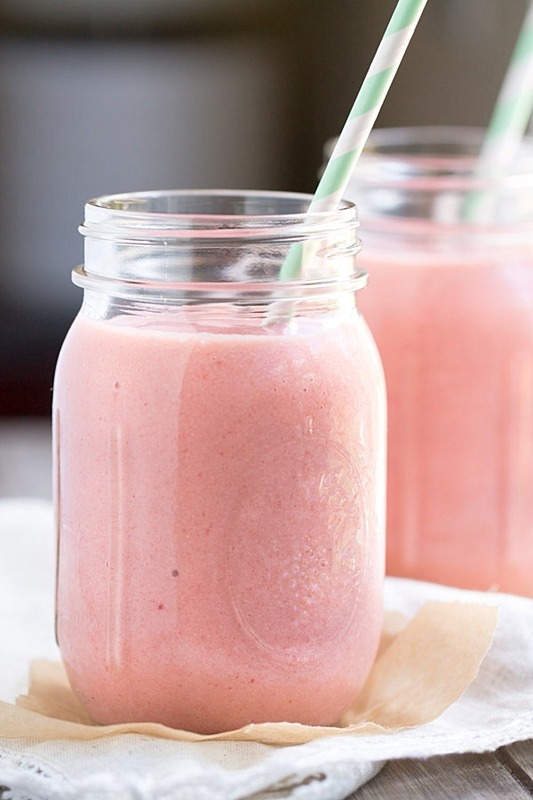 I’m kind of obsessed with cold, icy drinks this summer so I’ll have to try this smoothie! Thanks, Ashley! I hope you enjoy the smoothie! This looks deeelicious! I hope you have a blast in “Vegas, baby”. Tell Elvis hello for me! ;) Pinned! Tell Elvis hello for Claire. Ok, got it! ;) Thanks for stopping by and for the pin, Claire! Hope you have a FABULOUS weekend! Have a wonderful time on your vacation, Julie! Can’t wait to see pics :) Love the sound of this smoothie, it looks delicious! Looks delicious! I love smoothies and love finding new recipes…thanks for sharing! I think you are right about that!!! Or maybe a spiked smoothie. ;) Thanks for stopping by, Carol! HOpe you have a great week!